Welcome to the home page of Corunna High School, Michigan, USA, Track & Field and Cross Country. These teams carry a rich tradition of success and look to the future to hold the same. The teams reached great heights in the past few years with the boy's cross country team winning a state championship in 1997 and placing second on a tie breaker rule in 1998. 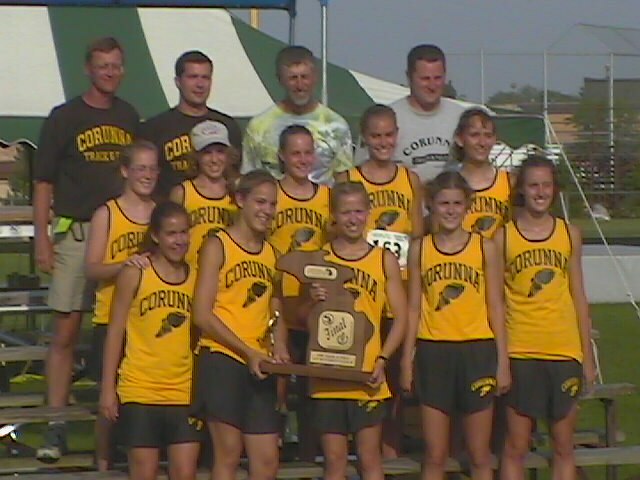 The girl's cross country team was third in the state in 1998. The boy's track and field team claimed the state championship trophies in 1998 and 1999. The girl's track and field team was state runner-up in 1997 and 1999. Bottom: Kelly Nequist, Alison Gross Lange, Nicole Johnson, Anna Carr,and Jamie Krzyminski. Middle: Erin Vavrika, Emily Faber, Colleen Lange, Mira Sager, Allyson Graham. Back: Coach Aldrich, Coach McDonald, Coach Wilcox, and Coach Herrick.